Teacher Created Resources OS 5257 - 36 sheets per pack. Fill up charts with mini stickers to motivate students to do their best. Measures 5 1/4" x 6". 7 columns per sheet. Record progress in homework, classroom assignments, attendance, or good behavior. Teacher Created Resources OS 5646 - 7 columns per sheet. Measures 5 1/4" x 6". Record progress in homework, attendance, classroom assignments, or good behavior. Fill up charts with mini stickers to motivate students to do their best. 36 sheets per pack. Teacher Created Resources OS 5141 - 36 sheets per pack. Measures 5 1/4" x 6". Each sticker is approximately 3/8' diameter. Get a great deal on super-sized value-packs of stickers. 7 columns per sheet. Acid-free. 1144 stickers per pack. Teacher Created Resources OS 4773 - Measures 5 1/4 x 6 Inches. Fill up charts with mini stickers to motivate students to do their best. Record progress in homework, attendance, classroom assignments, or good behavior.7 columns per sheet. 36 sheets per pack. Acid-free. 36 sheets per pack. Measures 5 1/4" x 6". 7 columns per sheet. 1144 stickers per pack. Each sticker is approximately 3/8' diameter. Pack of 2100 Colorful Dog Paw Print Stickers, 3/4 inch, 8 Bright Neon Colors, Great for Teachers, Classrooms & Veterinarians! TREND enterprises, Inc. T-73034 - Fun incentive pads engage children in goal-setting for good behavior and skill building. Measures 5 1/4" x 6". Acid-free. Each sticker is approximately 3/8' diameter. Ideal for teaching: pre-Kindergarten to 5th Grade Ages 4 to 101144 stickers per pack. 7 columns per sheet. 36 charts per pad; 5 1/4'' x 6''. 7 columns per sheet. 36 charts per pad; 5 1/4" x 6". Track and reward progress with coordinating stickers. 36 sheets per pack. Coordinates with Owl-Stars! Collection. 36 sheets per pack. Engage students in settings goals and building skills with these popular, effective charts. Measures 5 1/4 x 6 Inches. Track and reward progress with colorful, coordinating stickers. Ti-Awards Stickers - 36 charts per pad; 5 1/4" x 6". Fun incentive pads engage children in goal-setting for good behavior and skill building. Each sticker is approximately 3/8' diameter. Enjoys :children's gifts 3200 stickers 46 sheets with 8 themes: colorful hearts: 12 sheets/1008 stickers colorful dots: 12 sheets/648 stickers colorful stars: 12 sheets/744 stickers colorful thumbs: 2 sheets/160 stickers Colorful Flowers: 2 Sheets/160 Stickers Colorful Sunflowers: 2 Sheets/160 Stickers Smiley Faces: 2 Sheets/160 Stickers Smiley Stars: 2 Sheets/160 StickersTimeet Kids Reward Stickers Use for:Teaching & FunEncouragement &DiaryTests & RewardHomework & ScheduleGames Creativity & MotivationRecognition & BulletinsReminders &Chore chartBehavior chart & DecorationProgress chart & FunMaking fun face 36 sheets per pack. 36 sheets per pack. Ideal for teaching: pre-Kindergarten to 5th Grade Ages 4 to 10 Measures 5 1/4 x 6 Inches. 7 columns per sheet. Reward stickers❤️children's gifts 3200 stickers with 8 themes: Colorful Hearts/Dots/Stars/Thumbs /Flowers/Sunflowers & Smiley Faces/Stars. Reward stickers❤️Perfect for kids/students reward chart. 3200 Kids Reward Stickers Teacher Stickers for Students Incentive Chart Classroom Teaching Supplies Cute Colorful Stars Hearts Smiley Dots Faces Emoticons Thumbs Flowers Sunflowers 8 Design Themes - Reward stickers❤️perfect for planners, calendars, scrapbooking, notebooks, gift packing etc. Reward stickers❤️easy to peel off Please see the instructions on the image. Reward stickers❤️Sticky adhesive. TREND enterprises, Inc. 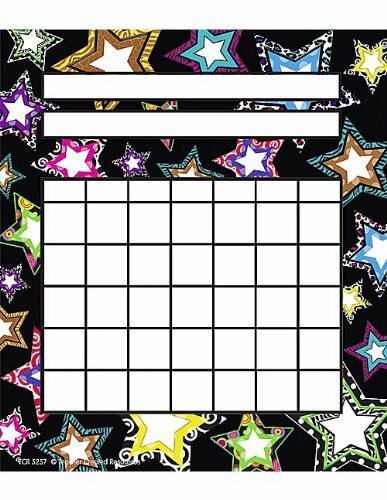 Praise Words ‘n Stars Incentive Chart, 17" x 22"
Teacher Created Resources OS 4774 - Fun incentive pads engage children in goal-setting for good behavior and skill building. Then record the progress in homework, attendance, classroom assignments, good behavior, etc. Track and reward progress with coordinating stickers. Filling up a chart with stickers is a sure way to motivate young students.
. Label each chart with a task and a name. 36 sheets per pack. Reward stickers❤️children's gifts 3200 stickers with 8 themes: Colorful Hearts/Dots/Stars/Thumbs /Flowers/Sunflowers & Smiley Faces/Stars. Reward stickers❤️Perfect for kids/students reward chart. Reward stickers❤️perfect for planners, calendars, notebooks, scrapbooking, gift packing etc. Teacher Created Resources Lime Polka Dots Incentive Charts, Lime 4774 - Reward stickers❤️easy to peel off Please see the instructions on the image. Reward stickers❤️Sticky adhesive. Great for home or school. 36 sheets per pack. Each chart measures 5-1/4" x 6". 36 sheets per pack. Measures 5 1/4 x 6 Inches. Each sticker is approximately 3/8' diameter. Teacher Created Resources OS 6633 - Acid-free. Ideal for teaching: pre-Kindergarten to 5th Grade Ages 4 to 10 Reward stickers❤️children's gifts 3200 stickers with 8 themes: Colorful Hearts/Dots/Stars/Thumbs /Flowers/Sunflowers & Smiley Faces/Stars. Reward stickers❤️Perfect for kids/students reward chart. Reward stickers❤️perfect for planners, notebooks, calendars, scrapbooking, gift packing etc. Reward stickers❤️easy to peel off Please see the instructions on the image. Reward stickers❤️Sticky adhesive. Great for home or school. 36 sheets per pack. Each chart measures 5-1/4" x 6". 1144 stickers per pack. Fun incentive pads engage children in goal-setting for good behavior and skill building. Get a great deal on super-sized value-packs of stickers. Teacher Created Resources Mini Happy Face Stickers Valu-Pak, Multi Color 6633 - 36 sheets per pack. Track and reward progress with coordinating stickers. Acid-free. 36 charts per pad; 5 1/4" x 6". 1144 stickers per pack. 36 sheets per pad. Track and reward progress with coordinating stickers. Each sticker is approximately 3/8' diameter. Encourage good behavior and track progress at school, home, and care centers with these handy pads. Space for name, and activity help engage students in setting goals, dates, recognizing achievement. Gel Stars Incentive Pad - Vivid design and printing, ample writing space. Acid-free. 36 sheets per pack. Bright, high-interest design is ideal for providing quick response and individual encouragement. Kids are excited to receive stickers for their achievements and show off their success. 5-1/4" x 6". Teacher Created Resources OS 5643 - 1144 stickers per pack. Ideal for teaching: pre-Kindergarten to 5th Grade Ages 4 to 10 Measures 5 1/4" x 6". 36 sheets per pack. Track and reward progress with coordinating stickers. 36 charts per pad; 5 1/4" x 6". Each sticker is approximately 3/8" diameter. Fun incentive pads engage children in goal-setting for good behavior and skill building. 7 columns per sheet. Reward stickers❤️children's gifts 3200 stickers with 8 themes: Colorful Hearts/Dots/Stars/Thumbs /Flowers/Sunflowers & Smiley Faces/Stars. Reward stickers❤️Perfect for kids/students reward chart. Reward stickers❤️perfect for planners, notebooks, calendars, scrapbooking, gift packing etc. Teacher Created Resources Superhero Mini Stickers Valu-Pak 5643 - Reward stickers❤️easy to peel off Please see the instructions on the image. Reward stickers❤️Sticky adhesive. Great for home or school. 36 sheets per pack. Each chart measures 5-1/4" x 6". 1144 stickers per pack. Each sticker is approximately 3/8' diameter. Acid-free. Trend Enterprises T73003 - Fun incentive pads engage children in goal-setting for good behavior and skill building. 7 columns per sheet. 5" x 6". Measures 5 1/4 x 6 Inches. 5" x 6" 36 sheets per pack. Kids are excited to receive stickers for their achievements. 5-1/4" x 6". Coordinates with trenD superSpots and superShapes stickers, or use pen/pencil/marker. 1144 stickers per pack. 36 sheets per pad. Each sticker is approximately 3/8' diameter. Ideal for teaching: pre-Kindergarten to 5th Grade Ages 4 to 107 columns per sheet. Kids are excited to receive stickers for their achievements. 36 charts per pad; 5 1/4" x 6". Acid-free. 36-sheet pad. Track and reward progress with coordinating stickers. 5 1/4 x 6 inches - Trend Enterprises Incentive Pads Reward Words - Pack of 36 - School or home use. Reward stickers❤️children's gifts 3200 stickers with 8 themes: Colorful Hearts/Dots/Stars/Thumbs /Flowers/Sunflowers & Smiley Faces/Stars. Reward stickers❤️Perfect for kids/students reward chart. Reward stickers❤️perfect for planners, notebooks, scrapbooking, calendars, gift packing etc.